MAKURDI— No fewer than 20 houses were reportedly burnt down to ashes on Monday by soldiers of the Nigerian Army as they wrecked havoc at Sati-Agirigi settlement area located along Katsina-Ala/Takum road in Katsina-Ala Local Government Area of Benue State. Our credible source revealed that the houses were burnt down in reprisal for the killing of a colleague to the soldiers who is said to be in the rank of an army Colonel, by some group of hoodlums. The said army officer, The Biafra Times gathered, was driving towards Takum area in neighbouring Taraba State when he reportedly ran into a thick roadblock mounted by a gang of heavily armed gunmen who on sighting him, opened fire and shot him dead instantly. According to reports, colleagues of the deceased from Takum, on hearing about the brutal killing of their man, mobilised their men for a reprisal attack in the area, burning down the houses of innocent locals. It was learnt that the action of the army officers made movement into Takum from Katsina-Ala absolutely difficult as the soldiers had mounted barricades on the highway to restrict influx of human and vehicular traffic. 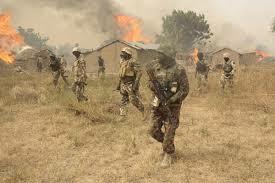 The soldiers, however, were reported to have retreated after unleashing the carnage on the community. Meanwhile, an eyewitnesses from the community said the area worse hit by the attack was the Federal Low Cost and Tomataan locality where hordes of residents including women and children have fled their homes due to alleged unwarranted harassment by the army personnel. An indigene of the area, Mr. Terfa Tyowua, confirmed the deceased army officer was heading to Takum when he was attacked and killed by armed robbers. He said: “The soldier was heading to Takum from Katsina-Ala with a vehicle a relation sent him to buy. It was about 10p.m on Saturday when he ran into a roadblock mounted by armed robbers who shot and killed him on the spot. Also a female student, Miss Patience Terfa, said the soldiers burnt many houses and rendered hundreds of people homeless. She said: “I was shocked with what I saw with my eyes. People ran and left their homes. More than 20 houses were set ablaze with everything inside. Also, a farmer who spoke on condition of anonymity, appealed to both the federal and state governments to come to the aid of the people by deploying security operatives in the area to help safeguard the lives of the people.